"Hitting Strikes" is the key to becoming a good and consistent hitter, as a pitcher is taught to get the hitter out with " His Pitch " and ....well, his pitch is hardly, if ever, a strike. 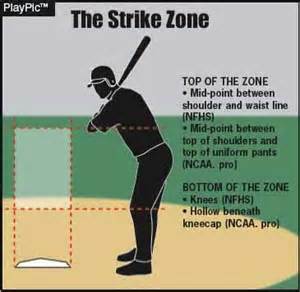 It would only make sense A player is never too young to learn the strike zone, but unfortunately, players of all ages and coaches alike, seem to be too consumed with the Task of hitting, rather than the What to hit. The "What" to hit will make the "Task" of hitting much more doable, which is what it's all about. (2.) Offers the coach the optimum viewing position in order to verify the batter called the pitch correctly. Calling the pitches incorrectly without correction defeats the entire purpose of the drill. Everything Except swing the bat and hit the ball. In other words he’s to mimic a normal Taking A Pitch scenario, with 1 huge difference…. (1.) He's to follow the baseball all the way into the catcher's mitt, requiring him to actually turn his head and follow the ball past him. (2.) He then tells you if it was a strike or a ball. Remember as a Coach, the intent of this drill is to educate your players on which pitches they should swing at, and which to lay off of. We're trying to teach <I>What </I> to hit ... not How to hit, so be sure to mix it up throwing strikes and balls. In older age players you can add another wrinkle to the drill, which includes pitch Identification as well as strike recognition. (1.) Take a group of very used baseballs, 15 - 20 if possible in order to keep the drill moving quickly. Place them in a bucket on the mound, not only for containment, but to hide which baseball you retrieve from the bucket to throw. (2.) 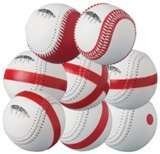 Take Different color Magic Markers and mark each baseball a different color designating a color for a particular pitch. (c.) Blue = Change Up and so on and so forth. The balls can be colored in any method you want, just be sure there is enough of the baseball colored as to make seeing the color possible. Outlining the seams is not good enough, I suggest coloring a quarter of the ball. 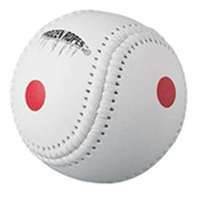 Perform the drill exactly as described above, except the Batter will be required to identify the Type of Pitch as well as whether it was a strike or not. (3.) Enhance Eye Focus on the baseball, which is critical for hitting.